Easy Mango Avocado Salsa is one of my favorite summer salsa! It’s full of fresh flavors and really easy to put together. It’s been so hot here last couple of days that we bought a portable AC! Yes I would have never thought that we would need an air conditioner here. But it has been hot and it was making it difficult for me to work in the kitchen. Now it feels so much better. I can stay near the gas or oven without sweating. This whole weekend we were running around getting things done around the house. It was crazy and I didn’t even realize how the weekend went by! I am going to very busy with family stuff mid of June till July so I am trying to finish blog work before that. My house is literally full of mangoes these days. Last I counted, I had 15 of them and they were all pretty ripe. I made mango lassi, mango milkshake but was still left with a lot of them and so I made this quick Mango Avocado Salsa. 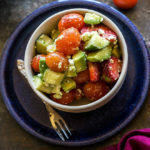 It’s a great salsa for summers and also super easy to put together! 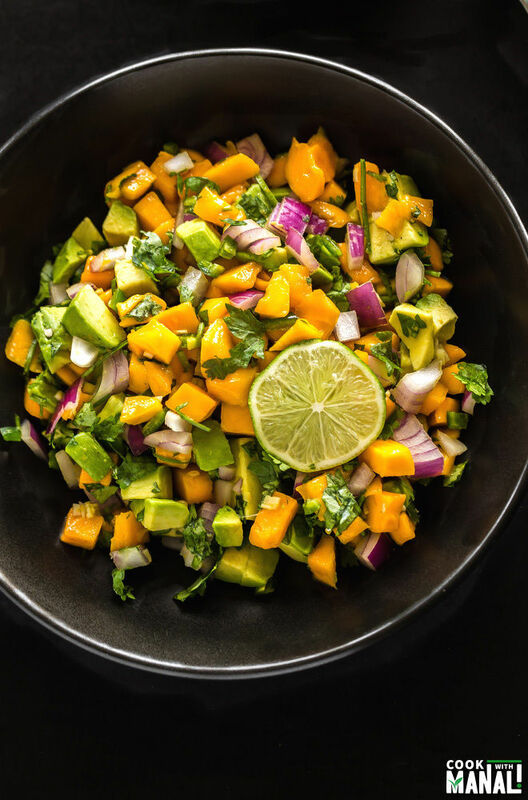 This summer salsa combines two of my favorite things – mangoes and avocados. I think you would hardly find anyone who doesn’t love these. Isn’t it? Seriously mango and avocados are so delicious on their own but they are so good together in this salsa! If you have a thing for sweet salsa, you will love this version. I ate a lot of this mango avocado salsa as such with a spoon. Obviously I polished off the rest with chips and also added some to a burrito, the recipe of which I will share later sometime. 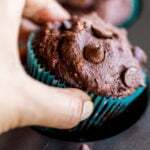 I don’t have step by pictures of this recipe because it’s pretty simple and straight forward. You just need to combine everything together and enjoy! 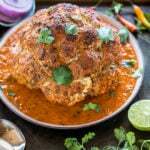 You can makes changes to this recipe as per your preference and taste. For example if you don’t prefer too much sweetness in your salsa, use extra jalapeno pepper in your salsa. Before adding the jalapeno pepper, I seeded them but if you want it to be really spicy, just add it with the seed. 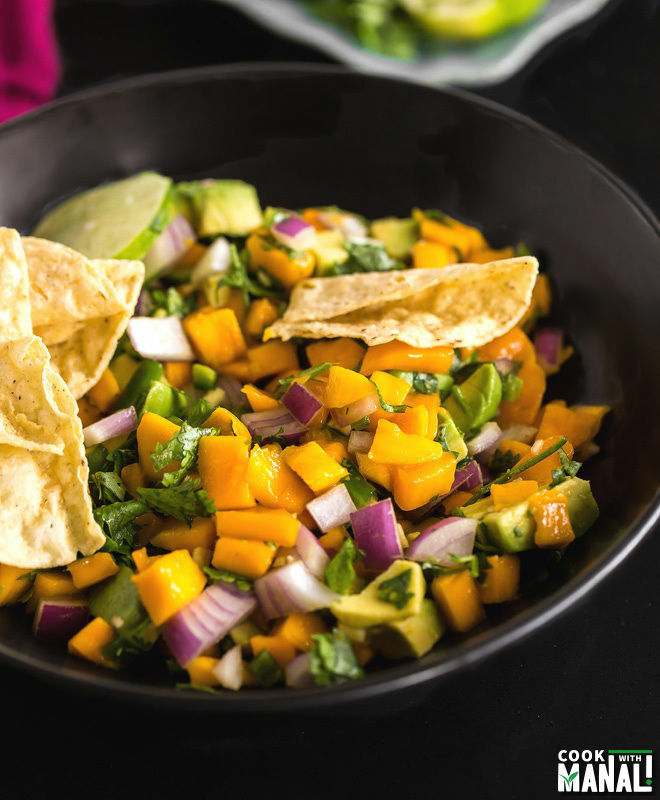 Enjoy this mango avocado salsa with chips or take a spoon and dig right in! * You may also add red pepper to this salsa. It will add some colors and flavors to this summer salsa! * You may use 2 avocados in this recipe in place of 1. I used only 1 because I only had a single avocado plus I wanted to focus more on the mango. 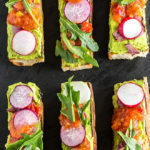 You may obviously use equal amount of mango and avocado in this recipe. 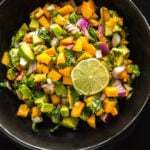 Mango Avocado Salsa is a delicious salsa for summer! Full of fresh flavors and really easy to put together. 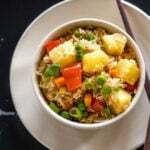 In a large bowl add diced mangoes and avocados. Add chopped onion, chopped jalapeno, cilantro and minced garlic. Mix till combined. Add salt and pepper to taste and squeeze in juice of 1 lime. Give a final mix and serve the mango avocado salsa with some chips on the side. Both mango and avocado are my favourite. This looks totally right up my alley. This is a favourite in our house and it goes so well with fish tacos too! 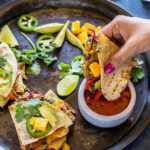 I just made a mango salsa last week, and I’m hooked! Your version looks gorgeous, Manali! I love that you added avocado. I think I could just dig in with a spoon! This sounds delicious, Manali. Such a great bunch of flavors mingling together! Thank you Rahul, it was pretty good! Thank you Danielle! yes they are pretty fantastic together! I know right, it’s one of my favorites! Thanks Marcie! There is no such thing as so many mango recipes, so keep them coming. And this salsa is absoluelty a winner my book. YUM! Thanks Anu! Never too many mango recipes right? Oh my gosh, I would totally eat this gorgeous salsa with a spoon!! Mango and avocado together is right up there with my favorite food combos, so I’m all over this pretty salsa! 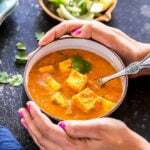 This sounds like a super tasty (and super easy) summer snack, Manali! We love a good salsa…especially late afternoon on the back porch. Thanks for the recipe. Oh, and we definitely have a portable AC unit, too. This summer is supposed to break records in terms of heat…ugh! Thanks David! Yeah can’t believe how hot it already is! I can’t get enough of mangoes and avocados lately! 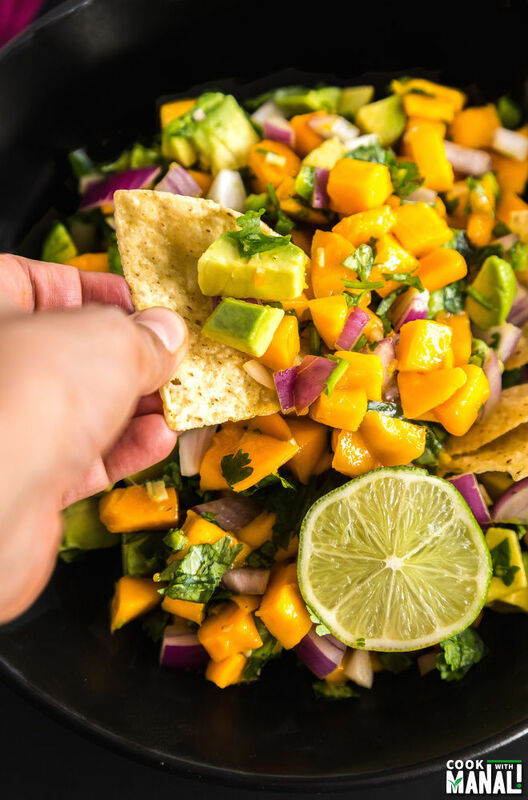 This mango salsa looks amazing, Manali! Perfect for cooling down with in the heat! 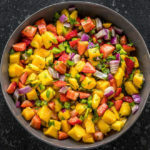 I’m a big fan of mango salsa in the summer, it’s refreshing and has a spicy kick that I just can’t seem to get enough of.